Every day, UMB harnesses the power of scholarship, research, and collaboration in the search for solutions to complex problems impacting individuals, families, and communities. 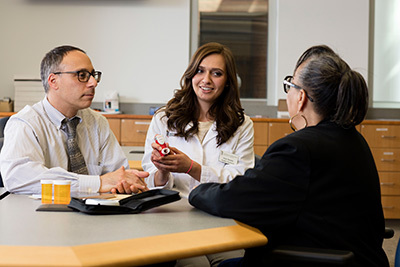 U.S. News & World Report ranks the School of Pharmacy 9th among more than 130 schools of pharmacy in the country. Established in 1841, the University of Maryland School of Pharmacy is the fourth oldest school of pharmacy in the United States. The School has received $32.1 million in grants and contracts from government, industry, private, and foundation sources during the 2018 fiscal year. Approximately 840 PharmD, PhD, and MS students are enrolled at the School of Pharmacy. Drug Take-Back Day 10:00 AM | SMC Campus Center Turn in your unused or expired medications for safe disposal at the SMC Campus Center. MS in Palliative Care Online Open House 1:00 PM Join us for a virtual open house about the online MS in Palliative Care program. MS in Palliative Care Online Open House 9:00 PM Join us for a virtual open house about the online MS in Palliative Care program. The curriculum challenges us to become the best pharmacists in the nation. The faculty teach us in a way that most students will never experience.